U19 Ukrainian League. 27th round. May 8. Vysoke. UTB Metalist. 20 oC. 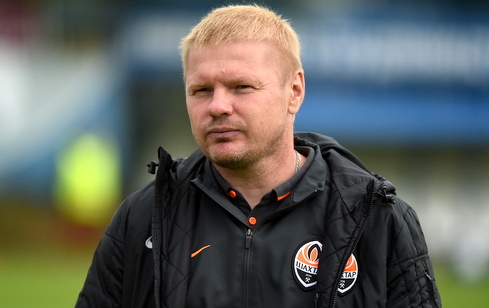 In the 27th round Shakhtar had an away game with one of the outsiders of the Ukrainian championship U19 - Metalist Kharkiv (14th place, 19 points). In 2016 the Kharkiv team have not won yet, while the Pitmen continued their impressive streak without losing in away games since September. In the first round the Donetsk team beat Metallist 2-1. This time, Serhii Kovalev's team headed for Kharkiv without Oleksanr Pikhalenko and Maksym Chekh, but with Dmytro Topalov back in the line-up after several missed games. The starting minutes saw the opponents being rather active and creating plenty of opportunities for an opener. A heavy shot by Artur Avahimian from a sharp angle was deflected by the home team's goalkeeper. Vladyslav Buhai turning the ball with a header after a cross from Volodymyr Hrachev just missed the far corner. At the opposite side Vladyslav Treshcheiko kept his goal safe. To begin with, the Shakhtar goalkeeper handled a one on one, and then deflected two close range shots from his opponents. After that, the game calmed down. When it seemed that the teams will leave for half time with no goals scored, a key episode of the match took place. Buhai was fouled by an opponent and the awarded penalty kick was coolly realized by Artur Avahimian - 0-1. The goal made the Pitmen more confident and loose. It was now necessary to build on the success, and the Donetsk team did not wait too long. 56 minutes into the game, they managed to mount an exemplary attack: Topalov passed to Buhai in the penalty area, and Vladyslav made a cross towards the oncoming Oleksandr Hlahola, who headed the ball into the net. Despite a solid advantage, Shakhtar did not slack, and continued the siege of the home team. Oleksii Zinkevych and substitute Orest Tkachuk had excellent scoring opportunities. Danylo Ihnatenko hit a powerful shot from a free kick but the goalkeeper got a hand on the ball. Attacking until the final whistle, the guest team did not manage to change the score. 0-2 - the Pitmen confidently beat Metalist and will now prepare for the final rounds of the championship. In the next match on May 15, the Donetsk team will play Stal Dneprodzerzhinsk. - In the first half, Metallist focused on the defence, which was not easy to crack. Although we created opportunities, we were rather slow in transition from defence to attack, and there were not many timely openings, the work with the ball was slow. At the end of the first half a great two step by Topalov - Buhai led to a penalty, which was realized by Avahimian. During the half time, we asked the guys to attack more aggressively, to work with the ball faster, to use flanks more. It so happens recently, that we play better in the second half. The team created a large number of opportunities, but, unfortunately, the realization is still not that good. We will work on it during training. We have four games left against very serious opponents. I always tell the guys that they need to go out there and show everything they have. - We were set for a tough game. In the first half, the opponents played very well in defense. It is good thing that we earned a penalty before half time and scored a goal. It was easier in the second half - we were more relaxed, created a large number of chances, but regretfully the realization was not great. The combination that led to the second goal was exemplary. We practice these attacks in training - one touch passes, with moving the ball to a flank, a cross and a finalizing shot. Now we will be getting ready for the upcoming games. These will be difficult matches and we cannot lose points. We will try to win every match, by giving the game everything we got.